Well since your opponent broke his stick...you need to make it worth his anger and run your remaining stripes off the table! It appears that you either have to shoot a combo, or take the 12 ball before you make the 14 ball. This shape is crucial...if you don't get a good angle to get the 14 ball...you'll have to get that shape off the 10 ball instead. If it looks like a scratch shot, just hit it softly and the 8 ball is money. 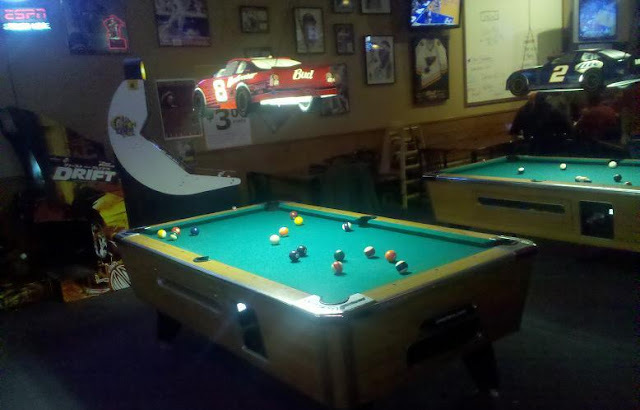 I usually shoot the ducks rail-first instead of cutting it back...lots of pool tables have a bad "roll-out" on them! You are lucky...your opponent rattled the 8 ball (and broke his stick on the table) and you have a chance to beat him. I like taking the stripe down on the rail first instead of trying for the breakout shot first. If you try the breakout shot first, you need to break out the 9 ball and get shape on the 9 to get down to the 14 ball. But by taking the 14 first, the breakout off the 13 should be easy with both the 9 and 8 ball down on the same end of the table. Thoughts? What would you do? I bet at one point she also said, "I dont need go to collage"
Your opponent scratched making his last solid and trying to break out the 8 ball. You have stripes and ball-in hand...win this game! I may start with the combination, but am showing an alternative method. You are relying on getting your other stripe out in the open enough after the combo. This could easily be messed up, depends on your comfort level on the combo shape. I could understand parking too closely sometimes, when the angle is difficult. 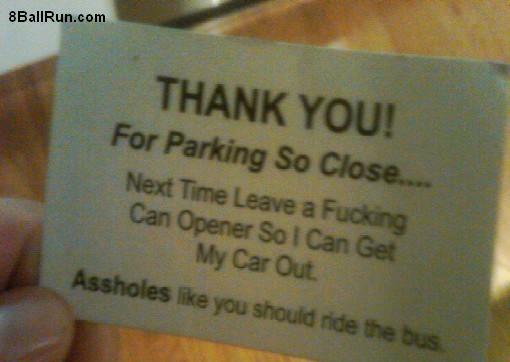 Maybe I should just make some bad parking violations to hand out to bad drivers! He was trying to cut the 7 ball in and it looked like he had room, but the cueball nicked the ball in front and drove the cue off line...knocking the 8 in. This screenshot is to settle an argument about our opponents this past week...this team won the WW Silver 2 years in a row before finishing 7th in the last season (2009-2010). We drove to Oklahoma City on Friday night, and drove the rest of the way on Saturday morning. At our gas stop in Kansas, I left the headlights on (they were on "auto" and I had the key turned over) and the Acura wouldn't start. 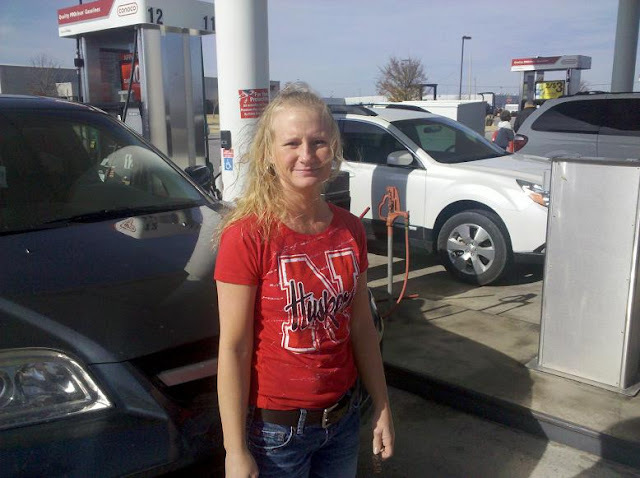 There were an abundance of Husker fans at the gas station willing to help out! Got a jump and were on our way within mere minutes. 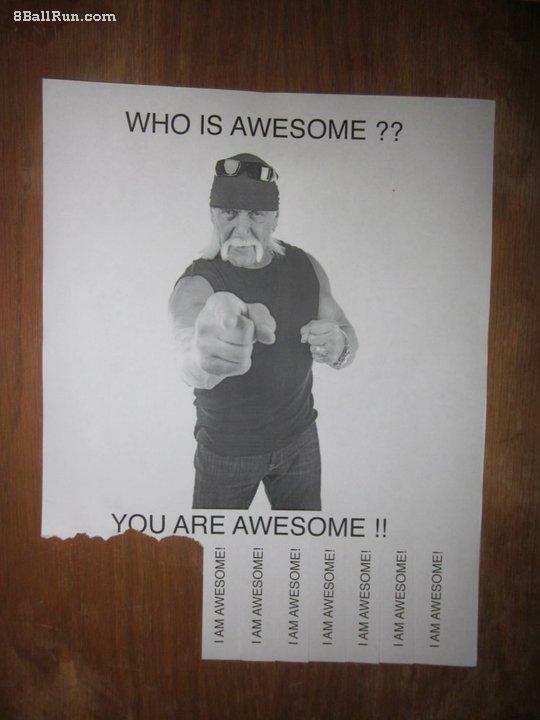 I landed us a couple cheap Holiday Inn rooms with my Priority Club points, mostly earned through work overnight stays. 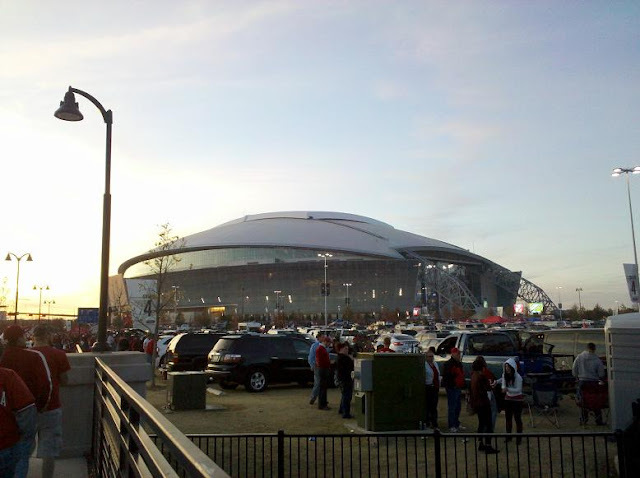 The next day we drove, I entered "Cowboy Stadium" into my DROID and it got us...well close to the stadium. Cowboy Stadium, Coppell, TX is different than Cowboys Stadium, Arlington TX. Got to the game okay, Nebraska started off great with a 17-0 lead early in the 2nd quarter...then we started fumbling and getting sacked left and right. Tough to watch the Huskers piddle it away with a 20-17 lead going into halftime and the defense holding Oklahoma to 6 points in the 2nd half! My wife's first Husker shirt! 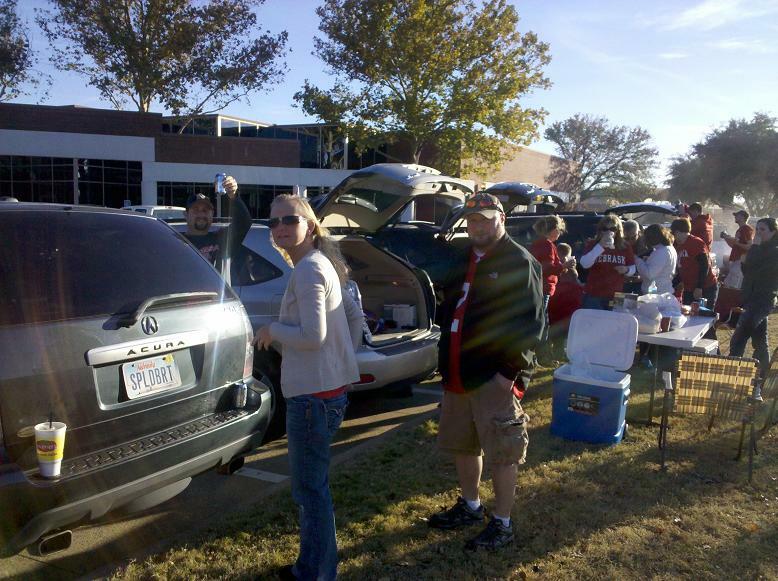 Pregame tailgate, we showed up unprepared...it was my first road game though! 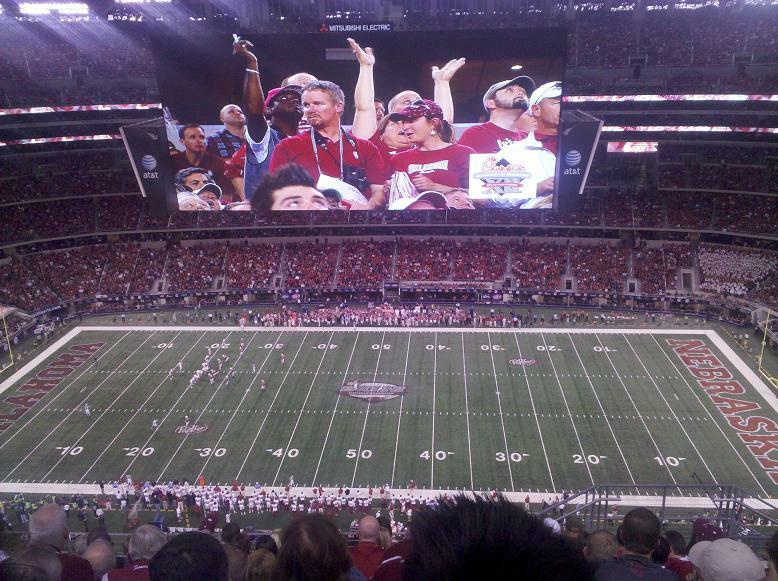 A view from your seats...the stairs up were at a steep angle! After the game, Applebee's had half price appetizers...we each had to get two then! The 7 ball on the center of the rail makes it difficult to get shape..the 7 ball shot can be made tough with the wrong speed or bad direction very quickly. I prefer the side pocket here for the 8 ball...just seems like a much easier shot and natural shape. This run out isn't to difficult once you navigate to the 7 ball. 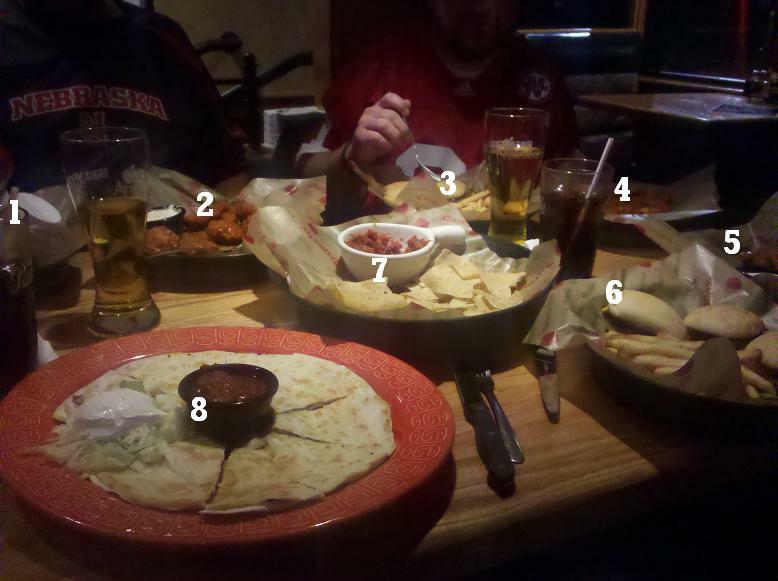 The shot below is what was suggested by my opponent saying that I made it " more difficult" than it needed to be. How would you have shot the 5 ball to get shape? I didn't like going the other way as the window seemed small and was a straight line to scratch.